Amós’ performance. Screenshot YouTube (Italia’s Got Talent – 25.01.2019). Mozambican circus artist Vasco Massingue‘s presentation at an Italian TV talent competition has moved audiences in Italy and in his home country. Amós, as Vasco likes to be called, made it to the semifinals of Italia’s Got Talent after beating over two thousand candidates with an act titled “Plastic Dance” — a portrait of the capital Maputo’s severe garbage pollution and the people it affects. Amós, 32, was born in Rossano Garcia, a Maputo province, and is a member of Cirque Du Soleil, the largest circus company in the world. He specializes in the aerial hoop, trapeze, and rigging. When explaining his performance to the jurors, Amós mentioned Hulene, Maputo’s single waste disposal site where a garbage slide in 2018 killed 16 people. Despite being lauded by the jurors, Amós did not progress to the contest’s following stage. 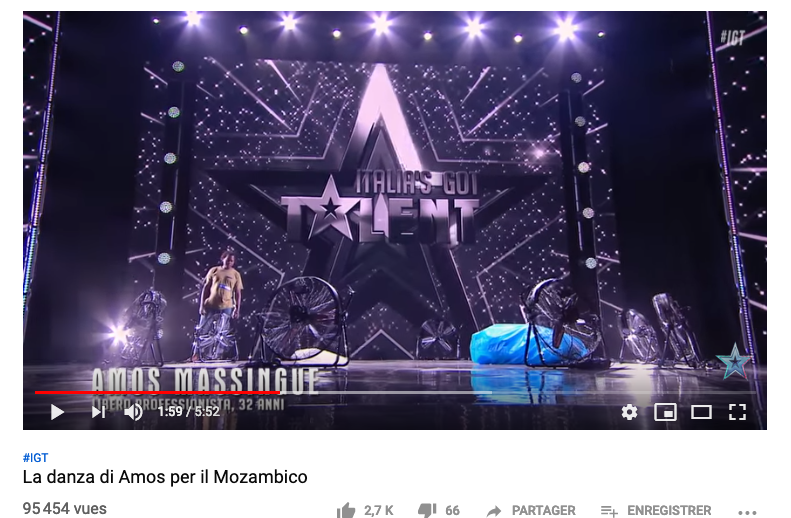 Several people in Mozambique shared the Amós’ video, which as of now was viewed over 25,000 times on Italy’s Got Talent official YouTube channel. Good Morning. A video of the performance in Italy’s Got Talent of a Mozambican, worried about the problem of garbage and plastic in Maputo. Also according to O País, Amós worked in Switzerland, Korea, Colombia, Tunisia, and Germany before moving to Italy.